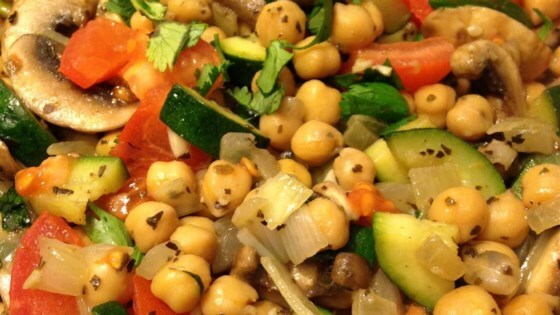 "This garbanzo bean and veggie stir-fry is great because you can add as many or as few ingredients as you like." Heat oil in a large skillet over medium heat. Stir in oregano, basil, garlic, and pepper. Add the garbanzo beans and zucchini, stirring well to coat with oil and herbs. Cook, covered, for 10 minutes, stirring occasionally. Stir in mushrooms and cilantro, and cook until tender, stirring occasionally. Place the chopped tomato on top of the mixture. Cover, and let the tomatoes steam for a few minutes, but don't let them get mushy. Serve immediately. Your favorite veggies stir-fried with a mild garlic, ginger, and soy sauce. This was not very good. I served it wrapped in tortilla wraps with some sour cream and that seemed to help but I don't think that I will make this again. Sorry. Oh. My. God. I love this! Thank you so much!! It's a nice, fresh tasting meal. Yum. I do add a lot more mushrooms and garlic.